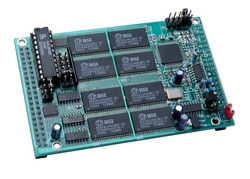 The GR16 is an inexpensive, ultra high speed (up to 10 MHz) analog signal digitizer, designed to be driven by a host TERN 16 bit controller. The GR16 supports a 16-bit Delta-Sigma ADC. With its outstanding high-speed performance, it is well-suited for demanding applications in data acquisition, scientific instruments, test equipment and communications. User confgurable FIFO data size, up to 4MB. Stackable multi units sharing Sync, and Trigger. On-board oscillator or external host clock.